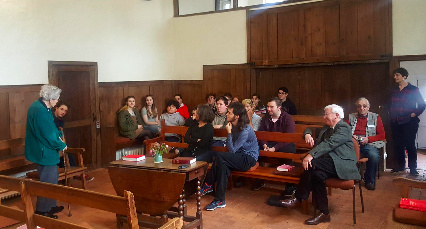 From the 9th to the 11th March, 16 London Linkers and 5 volunteers visited the historic Jordans Quaker Meeting House, (William Penn and Isaac Pennington are buried here). After meeting at Marylebone, the London Linkers jumped on a train to Seer Green. On the train, torches and reflective jackets were handed out, and tension began to build. ‘We’re not in Forest Hill anymore’, one young person was heard to mutter. We jumped off the train, into the pitch dark, and with torches at the ready, we headed into the woods. ‘Only at a Quaker event…’ another young person intoned, gravely, and with pride. 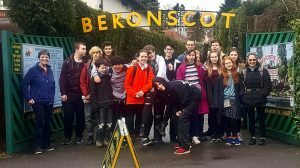 After safely navigating the roadsides and woods of Seer Green, we arrived at the Youth Hostel where we were to stay for the weekend. After some dinner and room-finding, games were played and a lovely calm Epilogue was had. The next day, after breakfast, the Quaker-y band of city-people headed straight to the biggest attraction in the area: Bekonscot Model Village, the oldest of its kind in the world. After riding the model railway around tiny-town until the intense thrill had finally worn off, London Linkers took in the sights in groups. Tiny model figures were seen walking down tiny cobbled streets; tiny running trains steamed along tiny railway lines; and a group of much larger Quakers sat down together to have a sandwich lunch. When we returned to the meeting house, Sally and Trottie ran a workshop about economic justice and how the whole thing is tied in tightly with fossil fuel usage and big business’s moneymaking concerns. Linkers particularly enjoyed the ‘adbusting’ segment, where magazine advertisements were scrutinised and their subliminal emotive messages were revealed. After dinner, we settled down to play a couple of Quaker favourites as a group: namely Mafia and Empire. We had another lovely Epilogue, gorged upon a biscuit feast carefully laid out by Eli, and then it was time for bed. In the morning, we attended Meeting for Worship at the Meeting House at Jordan’s, which is one of the oldest Friends’ Meeting Houses in the world. The simple beauty of this centuries-old Meeting House was not lost on the London Linkers, and the meeting was full of moving ministry. 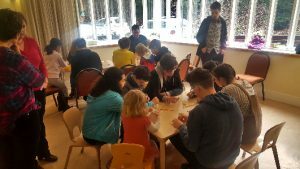 Some Linkers joined the local young Quakers in their children’s meeting, which was excellently co-run by a young Quaker from Jordans. Two London Linkers would pair up with a much younger Jordans Quaker, and they would make mosaic tiles together. 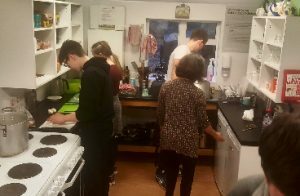 It was genuinely lovely to see the Linkers encouraging, helping, and getting on with the younger Jordans Quakers. After meeting, and having had our final sandwich lunch of the trip, we set off across the fields in search of a London-bound locomotive train. Morale was high, the weather was good, and it was a lovely end to a great weekend. 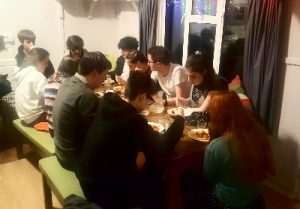 Massive thanks to Jordan’s Friends’ Meeting for hosting us so graciously in their meeting house for our activities during the trip, and of course to all London Linkers, young and old, who helped make the atmosphere warm, welcoming and friendly. We hope to see all of you at the next one! Eli, Noa, Sally, Trottie, and Scottie. Huge thanks to you for making this happen, such a gift for the community.